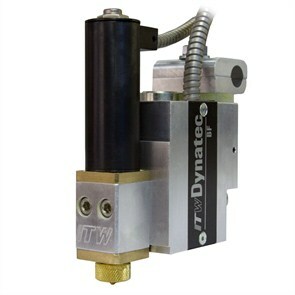 TW Dynatec's Mod-Plus Electric Applicator Head is an electrically operated, single or multi-nozzle hot melt adhesive applicator assembly with an integrated filter cartridge that prevents particulate matter from obstructing flow through the head. It is used with intermittent adhesive pressure and constant adhesive pressure hot melt adhesive supply units (ASUs). Each Mod-Plus Electric applicator features one to four adhesive valve modules mounted to a single service block. Each module is opened and closed by an electric solenoid. Springs are used to keep the valve closed when no electric signal is supplied to the solenoid. The rate of adhesive flow from the applicator is determined by the adhesive pressure applied by the ASU's pump, the size of the nozzle orifice and the stem stroke adjustment. The applicator is heated by replaceable cartridge heating elements which are controlled by an integrated RTD sensor and electronic control. Compatible with most competitive configurations. Built-in, heated filter has the largest surface area on the market, resulting in longer filter life and less nozzle clogging.